One of the Slow Festival fotos taken of Amanda Dixon (centre) of Tumbleweeds Events, the Slow Festival Co-ordinator with her "Slow" Crew. 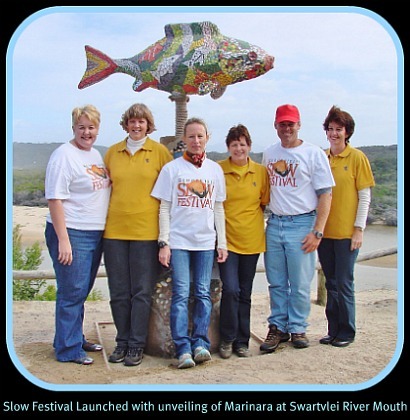 Aneli Gerber (extreme left) of Sedgefield Tourisim pitched in unreservedly to assist with innumerable chores to facilitate the Slow Festival and without the support of Shaun Van Eck and Knysna Tourism the event could not have been the success it was. 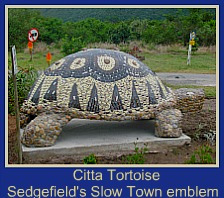 There were a good number of wonderfully diverse events over 6 days for the 2011 Slow Festival in Sedgefield. The undoubted highlight was the Sunday Morning Parade that involved Roger Titley's amazing creatures. Participants and spectators alike were intrigued by the animals that were being so realistically represented. One and all had great fun starting out at the local junior school where photo shoots were busily in progress until the menagerie began to line up for the parade. It was the kind of parade that people could get involved in. One person offered the cockerel on Roger Titley's shoulder, a drink of water. Another parcticipant gave a young child a chance to push a goose along the way. It all made for a great atmosphere and when we began to hand out drinks of water to thirsty creatures walking in their puppet outfits, many spectators willingly assisted. The brilliant local St James Church band led the way behind the cars of the local MG Club, the leader of which showcased the recently elected Miss Slow to the great delight of the driver, Geoff Mangan. Wending its rhythmic way to the beat of the band was the highly colourful and impressive giant dragon created by the Smutsville performing artists. 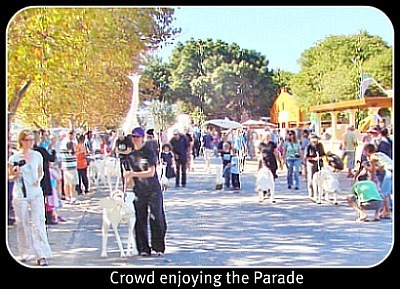 As the parade got under way at 10:30am it had already developed into a hot autumn day, so it was fortuitous that a good part of the procession was down the main street in the shade of big trees that protected spectators especially young children and participants in their animal outfits from baking in the sun and allowing everyone to enjoy the occasion. 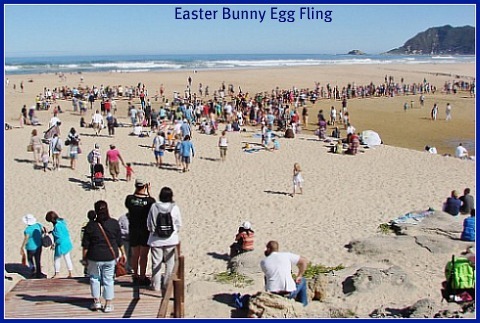 My Slow Festival fotos show that Sedgefield had a fabulous crowd turn-out of visitors and locals and the festive atmosphere that resulted later carried over to the beach where the children were looking forward to the highly anticipated Easter-bunny Egg Fling. The excitement was at fever pitch when the flying Bunny in his motorised paraglider came into sight over the dunes. In spite of being organised into 4 groups the enthusiasm could not be contained when the first eggs dropped from the sky and fleet-footed children just rarin' to go, raced across the sands to grab their chocolate prizes as they fell to the beach. One of the Slow Festival fotos capture the flurry and confusion that made it impossible for the small number of organisers to control the large number of excited kids. So there were a few tears from the little 'uns who missed out and a bit of frustration expressed by a few parents. It is back to the drawing board to come up with a better idea to ensure that every child will get an easter-egg next year. 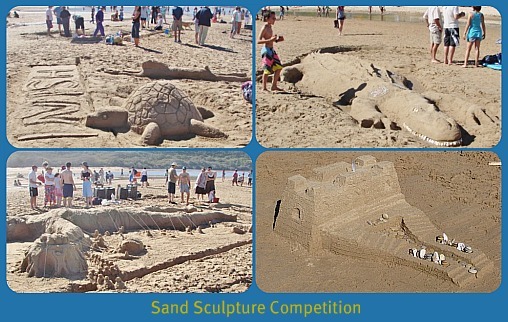 26 Teams enthusiatically gathered next for the Sand-sculpture Competition and there were many fabulous results. Some young children worked alone keen to create their masterpieces single - handedly. Many teams had painstakingly planned their artworks in advance and set diligently to work, each doing an allotted task. Some worked in family groups, others were groups of friends. One team was an international family that had gathered from all over the world who said afterwards that they had had such a great time together their intention was to make our festival a reason to get together in Sedgefield again. All clearly had great fun and it was extremely difficult for the judges to mark the sculptures. Only half a point separated 1st and 2nd in some instances so there must be many excellent slow festival fotos around town of the sandy works of art. Fortunately the judging was not the big issue, the real pleasure came from sharing the day with family and friends by doing something creative together down on our beautiful Sedgefield beach in glorious Autumn sunshine. Cola Views Complex on Cola Beach created their own fun event on Sunday morning to slot in with the Slow Festival, an Egg Rolling Competition. This required some pre-competition planning because firstly the eggs had to be hardboiled and then decorated. This would enable the competitors to identify whose oval artwork had won the race because they had to be subjected to a downhill dash on the complex's steeply paved drive-way! The first egg that reached the bottom (without losing its head), won! It seems that there were a few heats leading up to the final race. Good fun was had by all and the occasion cheerfully raised R400-00 for Hospice. 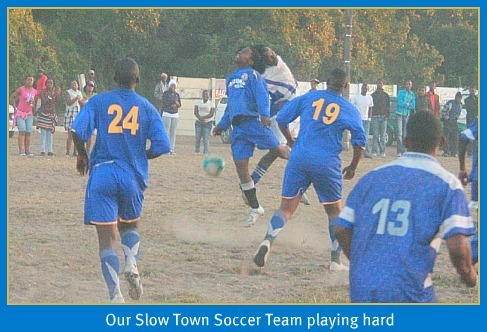 Sedgefield’s Slow Town Soccer Team went all out to win the Easter weekend Soccer tournament. With several teams playing, phenomenal local support encouraged Sedgefield’s team to play their hearts out. The Village Green was abuzz with the Pedal, Paddle, Pant Races on Monday morning. Early morning rain and cool weather threatened to put a dampener on the event but it wasn't long before the skies cleared and there was a good turn out for the trail run and the MTB race around Cloud 9. The 5km Charity Walk was enjoyed by folks of all ages and many brought their pets along to participate in the event. Where else but in a Slow Town could competitors bring their pets along to join in the fun? The laidback mood changed and revved up somewhat when the Lagoon Edge Spinathon got going and had everyone shouting for their teams. My Slow festival fotos caught some of the action of people working behind the scenes. 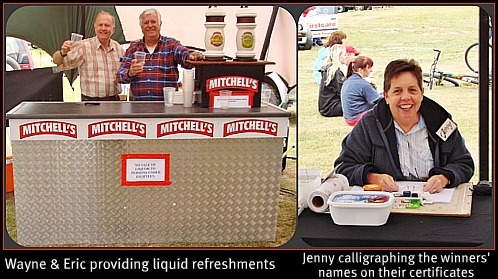 In the Mitchell's Tent, tables had been set up for the Pedal, Paddle, Pant registrations and enabled Jenny Birch to have a place to sit where she could calligraphy the winners' names and times on their certificates in an attractive and graceful old time way. Gunther of Mitchell's Brewery had kindly provided the bar and draught beer for barmen, Wayne Ferguson and Eric Watson to supply welcome liquid refreshments to competitors and spectators alike. They also had colddrinks for sale. 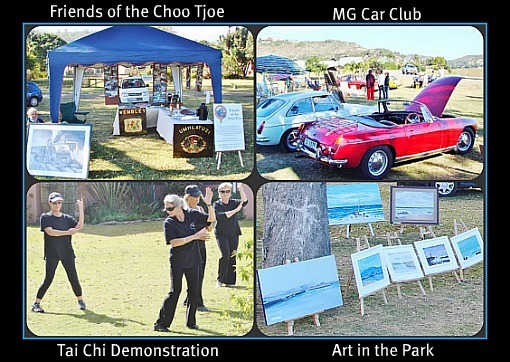 There were also many diverse fringe events to be captured with Slow Festival fotos like Art in the Park, the MG and friends Car display, Briony's Tai Chi Demonstration and the Friends of the Choo Tjoe Information Stand. 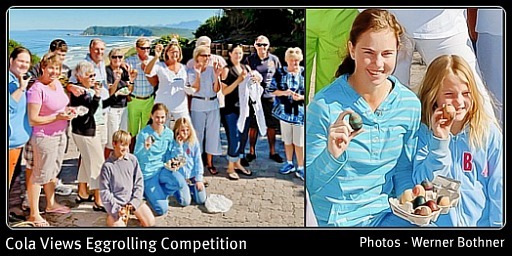 There is also a Sedgefield Moments on-line photo competition being held for the duration of the festival each year. These are just a few of my Slow Festival fotos of some of the activities on offer at the 2011 Slow Festival over the Easter weekend. In only its second year it is proving to be a worthwhile and well-attended festival. New events will be added in the years to come and less popular events will be scrapped. Be sure that the festival is on its way to establishing a name for itself as it is offering great family entertainment in a laidback and wholesome way. Although it adds some excitement, the competition factor is less important than enjoying yourself and having fun with your family and friends.